Exterior Doors that offer what you want to see! There just aren't a lot of places to go look at doors. It's a fact. With many doors running thousands of dollars, and warehouse space at a solid $1 a foot to lease, it just makes no sense to have 200 doors on display anywhere. That makes the door hunt difficult. You can go to Home Depot and Lowes. Then head off to Seconds and Surplus to see what's over there. You'll spend the entire day looking and not find the perfect thing. We try to make that easier. Yes we offer several different manufacturers to offer fiberglass, steel, iron and exotic wood doors as well, but more than that we use the suppliers that make it easiest for us to meet your needs. Any door project should have a Pre-Hung Door with new jambs and weatherstripping, threshold that is adjustable and a manufacturer that is reputable. Sometimes a nice bronze color on the threshold gives an upscale look and some time spent on hinge and hardware color never hurts. If an exterior door gets a great deal of water exposure it may be needed to use a frame-saver jamb to prevent wicking and decay of the door jambs themselves. Most doors are hung on a 4 9/16" jamb, but 5 1/4",and 6 5/8" jambs are also used on occasion. They come pre-drilled for deadbolt and door knob, with hinges included, but no hardware as far as handles and locks. Make sure to get new locks for your new door. There will also probably be some materials necessary to complete the install. We can provide you a materials list or bring standard materials with us at the time of your install. Most doors will require new interior casing, and either parting stop or other wood to full in the gaps on the exterior, if not brickmold and/or 1 X 2 or 4 exterior casing in select pine or rough cedar. Most front doors are 36" wide, most back doors are 32" wide. The door units themselves are 81 1/2" tall with jambs and threshold. We are proud to offer an extensive line of tall doors in eight foot (8') heights up to 98" with all new door frames, threshold and weather stripping. Because I care so much about installation and the end result on your house. I wrote this best practices white paper on Professional Residential Door Installation Procedures. Steve in Arlington offers a great review for our installations and our ThermaTru Prestained Fiberglass Entry Doors. Here's a neat full view door from Steve in Winnetka Heights Dallas who also got the factory stained exterior door from ThermaTru. This was a post about Flush Glazed Exterior Doors as opposed to the ugly plastic frame type ones you see so often. ThermaTru also has a pretty cool door builder program to help you see the options available from grains to finishes. Make sure to get the finished model number! What are the door options and choices for the rear of the home? As a rule Patio Doors are usually Sliding Doors and are used in areas with little room for a swinging door. French Doors are doors which close in the middle and both doors operate. There are also Center Hinged Doors with one active and one stationary panel, hinges in the middle and a knob and a deadbolt on one side or the other. Doors with grids are available in almost every door style and type with the exception of blinds between the glass doors or stained glass type doors. There are a lot of options and choices to be aware of for sure. If it's choices you want, along with expert installation there is only one thing to know ultimately, and that is who to call. Our goal is to make sure you get the best installation available for your doors. If craftsmanship matters, we're here to help. Feel free to have us out for a free evaluation of your home. To make things easier have a look at the exterior front and back doors in the following links. The first link shows all Fiberglass door types and is very helpful when searching for a new front door. If Wood Doors are more to your taste we offer this great line that is locally made here in North Texas just North of Dallas. This is the Pella Door Manufacturer and they offer one of the most amazing and exotic door made in America. These are not the cheap doors and for the most part you can't get them under $1000 for the most inexpensive models, but they are really amazing just the same. Realtor Magazine recently noted that a six thousand dollar door system can increase the value of a home by $10,000 when the right product is used. Knowledge and experience are key. This picture is about installation. A new french door is a great thing as long as the installation is up to par. The new wood and trim on this patio enclosure says a great deal about the homeowner, the installer who hung it and even the dog who's door is at the end under the window. Would you have known how to trim out this patio enclosure? Would the average window and door guy? Probably not. Thirty years of experience in very high end homes for retrofit replacement is as tiny niche of remodeling and home improvements but it's one that I'm glad to be a part of. If skill, craftsmanship, quality of product and work as well as value and longevity, matter to you, we are the door installation contractor that you should get to know today! For the longest time I thought every french door had an ugly plastic frame and screws on the inside to hold it together. If you were lucky it would have some screw cover caps to put in the holes but those usually didn't fit, didn't look right or just fell out. Whatever the case may be, they were ugly. Go look at the Home Depot and it will refresh your memory. Our Doors have Low E Glass with Argon Gas and are four times more energy effecient than a wood door. Two inches wider and six inches taller a glass size means more light and a better look. 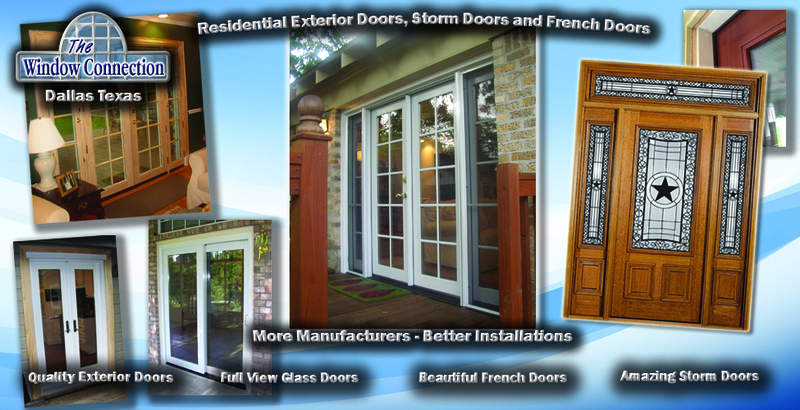 We're very proud of the products we find and endorse and this is a great one if you're considering a french door. I think there is no better door and it's amazingly affordable as well. Not much more than the cheaper option adding just a few hundred dollars to the total cost of a door project. This is one of the neatest doors we sell. Wood for beauty on the inside and Aluminum Clad on the exterior for a maintenence free exterior. By far one of the most upscale looks you can have on the back of the house. Ultimately the most important part of any door project is the installation. While you can get a door from almost anyone the real question is "Who will install it and will they be any good at it?" This is the question that really matters. If you choose a door from us, you can be assured there will be more quality in even our least expensive door than you can get from almost any other vendor. We pride ourselves on a quality of workmanship that is heads and shoulders above the rest. Some of our most popular products are from ThermaTrue and Jeldwen. Make time to look at their websites from our Links page and see what they have that may improve your quality of life. I keep some pretty cool stuff on my Google Plus Profile. Between the two profiles they have over a million views. Our Alside Windows Page is new! This is a Window Connection favorite. Our Blog has some pretty cool articles about noise reduction and some of our recent projects.